I remember when I was a kid thinking that being an adult must be awesome. While being an adult and a Mom is great, there are times when I really think about what we adults miss out on from not being kids anymore. The great thing about being a Mom is we get to enjoy a lot of these with our kids! 2. Allowance. Being totally ignorant of what bills are. 3. Playing on the playground. 4. Birthday Parties and Hoopla. 6. Biggest responsibilities are setting the table and making my bed. 7. Believing in the tooth fairy, Santa Claus, et al. 9. Seeing the world with fresh, innocent eyes. 10. Stopping to smell the roses. All the time. Did we mention Nap Time? 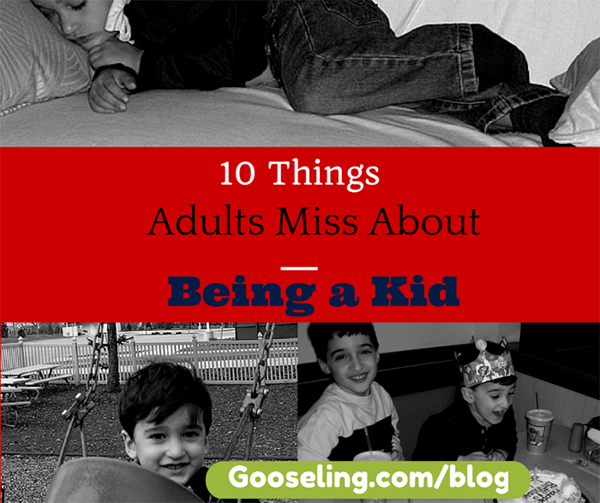 What do you miss about being a kid?